Sewing machine is one of the most important equipment in garments manufacturing industry. Simple automatic sewing m/c is one of the types of sewing machine. Simple automatic sewing m/c includes button attaching sewing machine, button hole sewing m/c and bar-tack sewing m/c. This article has presented those automatic sewing machines with their features. Some machines are found to sew for special purposes such as button hole making, button attaching, bar-tack creating and so on. In these machines, the predetermined work is done by cyclic order that is why called simple automatic is sewing m/c. It is a simple automatic sewing m/c. Easy adjustment of hole size and stitch density are facilated here. For heavy fabric, hole is cut before sewing. For lighter fabric, hole is cut after sewing. Special type of sewing thread is used for sewing. To raise the stitch is called gimp. Stitch type: lock or chain stitch may be used. It is a simple automatic machine. Button positioning can be automatic. Sewing is done according to the hole in button and may be cross or parallel. Automatic feeding of the button. It is used for heavy fabric sewing. It is used where the garments in high pressure such as belt loop, pocket corner. 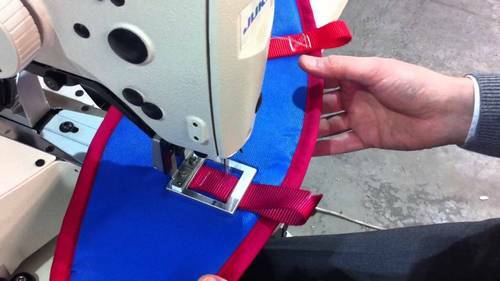 What do you understand by automatic sewing m/c? Mention the key features of button hole sewing m/c. Mention the characteristics of button attaching sewing m/c. Point out the features of bar-tack sewing m/c.